It's no accident that when Nintendo decided to do a direct sequel to a Zelda title — well, as close to a direct sequel as the series is ever going to get — it chose The Legend of Zelda: A Link to the Past as its reference point. A Link Between Worlds is set some years after the events of the 1991 SNES classic, but it uses a very similar map layout and very effectively tickles that nostalgia bone, as well as providing enough innovation to stand on its own two feet. As amazing as the recent 3DS outing unquestionably is, the level of hype which surrounded its release might not have been as high had it been an entirely new venture; the excitement which accompanied the game's launch speaks volumes for the level of esteem in which Link to the Past is held. 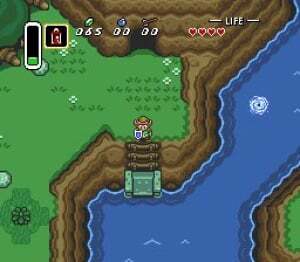 In the Zelda canon — which isn't short of solid-gold classics — this 16-bit adventure is considered to be one of the very best, and playing it on the Wii U today proves that the years have done absolutely nothing to dull its dazzling brilliance. 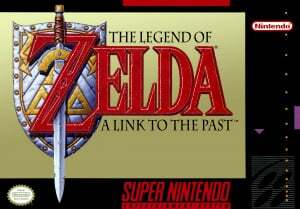 The game reverts to a top-down viewpoint just like the one witnessed in the original Zelda (Nintendo had dabbled with a side-scrolling perspective for The Adventure of Link) and presents a world that is so fully formed and eye-catching that it puts its contemporaries to shame, which is quite an achievement when you consider that this was a very early SNES title. The chunky cartoon-like visuals have a solidity and definition that even the 3D Zelda titles have struggled to challenge, and the game's appearance has become something of a signature look for subsequent 2D outings — Link's Awakening, Oracle of Ages, Oracle of Seasons and Minish Cap all owe a debt to Link to the Past. In many ways, Link to the Past was the Zelda game which would lay down the blueprint for other entries to slavishly follow. You explore a massive, sprawling overworld in search of your next objective, entering dank dungeons in the hope of claiming a new item which allows you to access other parts of the map or defeat certain enemies. The items contained within — which include a bow, boomerang, hook shot and fire rod — are usually instrumental in both completing the stage and defeating the boss which awaits at the end. It's a very early example of gear-gating, and has come to influence game design massively in the years that have passed. What really sets Link to the Past apart from similar titles is the vastness of the world you're expected to explore. Hyrule is divided into distinct areas, each holding its fair share of secrets. These days, the term "open-world" can be applied to countless titles, and while Link to the Past might not offer quite the same freedom as the likes as Elder Scrolls: Skyrim or Fallout 3, it grants just enough to make you feel like you can deviate from the beaten path and discover something new or hidden. And of course there's that twist halfway through — Hyrule's Dark World doppelgänger effectively doubles the size of the game, not only offering new locations to explore and characters to interact with, but also opening up some ground-breaking puzzles which revolve around switching between the light and dark worlds in order to reach certain locations. These days, such mechanics might seem commonplace or slightly twee, but back in 1991 this was nothing short of revolutionary. Link to the Past isn't without its faults. Sometimes the game leaves you high and dry without a clue about where to go next — so much so that the Western versions of the game were packaged with a sealed "hint book" which could be opened when you became hopelessly stuck. However, with the arrival of the internet — not to mention the godsend that is Miiverse — this isn't the problem it was back in the early '90s. With modern titles like Dark Souls providing an even more obtuse challenge and expecting players to share hints in-game or venture online to crack its secrets, Link to the Past feels surprisingly clear and straightforward in comparison. 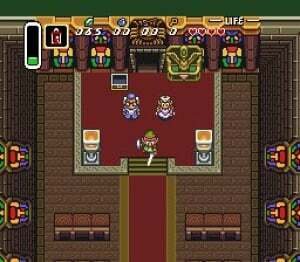 Link to the Past is rightly considered a 16-bit classic and offers hours of engrossing entertainment and tantalising challenge. Not many games from twenty years ago still feel as fresh and tightly constructed as this; it represents Nintendo at its very best. Everything is so focused and finely-tuned that it's genuinely hard to see how it could possibly be improved upon. The release of the 3DS sequel could have been an event which highlighted the flaws of the SNES original, but in fact it merely illustrates how fine a piece of software it truly is. What we have here isn't just one of the finest games in the SNES library, it's one of the most engaging and captivating classics in the history of video gaming. I hope this comes to North America ASAP! A Link to the Past is such a classic. By the way, I'm almost finishing A Link Between Worlds and I'm genuinely torn about which one is better. Which says something when you realized this is more than 20 years old. Needs to pick this up. I'm certain they will have it at some point for NA WiiU VC. Ideally would have loved to play it on the gamepad before Between Worlds came out. When they start putting SNES games on 3DS, I want this game to be first. Totally agree with that review. Glad to see the perfect score. Otherwise I'd have to remove the site from my bookmarks. Very first sentence: did you forget about Zelda 2? Majora's Mask? Phantom Hourglass? Despite owning a SNES I never played this first time round. I picked it up on the Wii VC and what struck me was the production values, the scale and look of the game is stunning. A true classic & the Wii U version gives me a good excuse to revisit it. Since a 3DS version is probably off the table I might pick this up on Wii U having never played it before. Sublime! Feel sorry for those experiencing it now with video gaming moving on so fast it prob won't have the same impact. 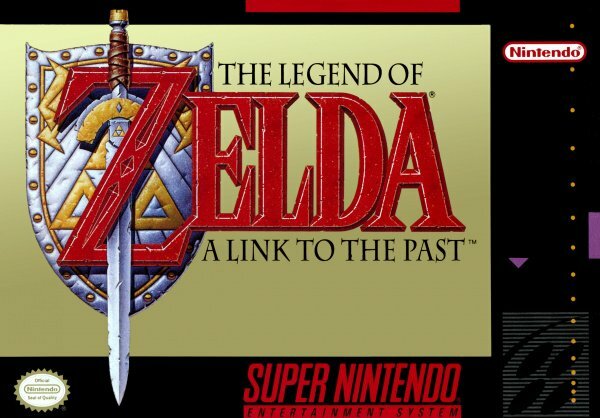 This was the first truly great Zelda, an epic masterpiece. Back in the 90s, to a 12 year old boy, this was an incredible experience. Hadn't played anything like it at the time. Used to rush home from school to continue the quest. Loved exploring the dungeons and finding new gizmos. Enjoyed Link Between Worlds but after pondering for a while I prefer the good old chest way of finding new items in each dungeon rather than renting them. Perfection!!! genius from beginning to end. playing Oracle of ages for the first time through on the 3ds. hoping it's good. never got to that or seasons, never did understand the appeal of the gameboy or color until gba came out. glad I never tugged on my mother's shirt for a gameboy. tech wasn't really fascinating. This game definitely deserves a 10/10. One of the best games in existence. I have NO idea how many times I've played it from start to finish. I absolutely love this game, so I was a bit surprised that it's started showing it's age! Especially after A Link Between Worlds, which is one of the smoothest gameplay experience I've had, I did find myself longing for a bit more fluid controls and I also couldn't help missing A Link Between Worlds' stellar soundtrack! Some tunes, like in the boss fights and The Skull of Woods, could use a bit more bass and variation. Those aside, this is a true classic in design, composition and execution! I know it's a bit foolish to compare games with over 20 years between them, but you can really see the advancements the series and it's developers have gone through. This game will come to NA VC soon, without a doubt. @Mayhem what does this mean? Picture quality isn't what it could be or what? Despite the fact I still have my SNES cart this was an insta-buy on Wii U for me. I won't download as I have it on the VC some where! Unless it's £1.50!! but I doubt it. Picked this up immediately upon release. Playing the top down Zelda like level in Super Mario 3D World, I couldn't help but want a top down Zelda game in glorius HD. Who knows, anything can happen. Naturally this should not be in the place of a full scale 3d title. @Pj1 it's £1.50 if you have it on the Wii VC and have linked them. This game is definitely my all time favorite. I played this so much when I was young and over again through the years, I remember almost every little secret to be found in it along with the fastest way to beat the game. The new one is right beside it mixing the old with some new, amazing work on that. I'm willing to pay that extra $1.50 to play this directly off my gamepad. Is this game not one of the few that was optimised for 50 Hz? Because then it really doesn't matter much. I think this game is omtimised for 50 Hz. The same as with Super Metroid. Probably the best Zelda game. I love this game, it's my favourite Zelda game. C'mon for 3DS soon please. In answer to the comments, the vast majority of VC games are the original 60Hz versions that the US got, even in the Euro store. LttP happens to be one of the few that are the original 50Hz release back in the day instead. Nintendo. Releasing a sequel to one of the most beloved games of all time, and NOT releasing the original beforehand on Wii U, despite it already being available on the Wii eShop. Even the absolute simplest, most obvious marketing techniques elude them. I can't wait for this game to be available in North America. I'm not even a big Zelda fan, but this game is absolutely incredible. Can't wait to play it again. Eh, to be honest I think the swordplay in this one is pretty awkward, it wasn't perfected until the Game Boy game, where it was just flawless. Having never played this, it should be interesting for me to jump into this one. I loved ALBW, and this is one of those classics you just have to have played in your life. On the other hand, I still haven't finisted Super Metroid..
For crying out loud....50 Hz again? No sale. Oh Come on Reggie! Release the game already! You think we're not cool enough? For every week that A Link to the Past does not hit the NA eShop, I will submit a picture of Reggie photoshopped into embarrassing and suggestive scenarios to every major news outlet. They will be crude and unflattering to his figure. Gaming Perfection indeed. The SNES and its games are so amazing and this may be the best of them all! Not to be a troll or anything, but I find this to be one of the most bland Zelda games ever. I prefer almost any of the 2D Zelda games over this one. In particular, I think Link's Awakening is a much better game. I have beaten LttP 4 times... not because I like it but because I keep hoping that I'll finally see the magic everyone else sees. But I think I've finally given up. @Sketchturner Even though I personally love ALttP, Link's Awakening is one of my favorites. Great game! I got A Link Between Worlds but gave my 3DS to my brother so he can play it. If I play Link To The Past now & then Worlds later will it sorta tire Worlds out? Or should I wait to play the newer Worlds 1st? Greatest Zelda of all time, for ever and ever. @snoox Link between Worlds is still a new game. The overworld and story are very similar, but that's about it. @gaby_gabito Thats what I'm waiting on as well... I picked up LTTP on Wii eshop this past month through club nintendo, played a few dungeons (lots of fun), then learned Europe got LTTP on Wii U last week, so now I don't want to go any further in my Wii copy because I rather play it on the gamepad... and before Christmas when I will play LBW. I wish I could copy my save file over, sigh. @GTWarrior77 A top down zelda game in HD? It just seems like that is a big waste of the GPU in the Wii U. I would have supported the idea on the OG Wii..... The Wii U right now needs a Zelda game like the 2011 (Or was it 2012) Zelda Tech demo. If NInty shows the new Zelda game on Wii U to look something like that at E3 2014, they would steal the show. @samueldlockhart They're not direct sequels in the same sense. Link Between Worlds uses the same overworld map as LttP. @DerpSandwich Yep, you're right. They could also have released SMB3 the same day as ALBW, SM3DW, and ALttP. False. i had never played this game until last year. as a matter of fact, it is among the first few zelda games i played (the very first is spirit tracks). but i can honestly say, this game is among my favorite games of all time, and i have no nostalgia to even have with this game. it's good simply because its a good game, no amount of nostalgia changes that. and if we're talking about Nostalgia being the only reason a game is good, then it'd be smarter to bring up OoT. they are, however, direct sequels. each of them take place with the same link, and not too far from when the first part ended. they're more direct sequels than this one is, imo. ...yes it is. its available on Wii Shop isn't it? that's accessible via ViiU. there's also a GBA port and its available on SNES. Why are people complaning that ALTTP is not coming to the 3DS? Ever heard of the GBA? i have to agree with most of the posts that this game was and is still a favorite of mine of all time, across all systems including Sony, MS. I like the weapon gating formula of the older Zelda games. It is part of the game I have grown to enjoy and expect. It is the one little hint in the massive problem-solver that you can count on, "If I find that new weapon I know what it takes to defeat the boss." You know though, the new one aLBW captures that feeling felt in the original LoZ where you could tackle the dungeons in any order you dared to. 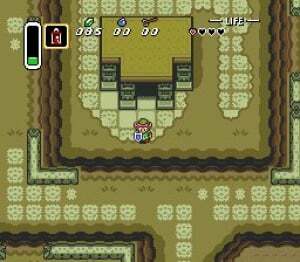 I remember the rupee runs to pickup the magic armor early or obtaining the Master Sword early and whizzing through the rest of the dungeons. Those are neat and as great as aLttP was, it does not easily allow similar moves. Still my favorite Zelda game of all time. Once I finish A LInk Between Worlds I am going to have to fire up the SNES and play this one again. @sketchturner While I love ALttP, I too love Link's Awakening better. Maybe because it was the first true action adventure game I played, one of the three first games I ever played, the cute sprites, the massive amount of stuff to do, it being portable,... Don't really know, I just love it. @TheOneHacker: "and if we're talking about Nostalgia being the only reason a game is good, then it'd be smarter to bring up OoT." This was the first Zelda Game that I have ever played. It turned me into the Zelda fan that I am today. I remember playing this game in the 90's by accident (didnt know what that game was). One of the best games ever made. Back in the days when renting games was the norm, I rented this by accident too (I played a lot of games, I think Yoshi's Island is the most memorable) But I had never finished it. I always got confused where to go, and I remember charging back and forth in the Dark World, as lost as in the the Water Temple, from OoT. I'd say it's tied with Super Metroid in grandeur. yeah those are great games and Its not even right to point out 'the' best game ever (and not even interesting). That said, these Zelda games, (link to the past, ocarina, twilight princess) are definetly amazing titles that are worth your time thats for sure. Thanks for sharing your experience. Metroid is also very sick. Hasn't someone thought about asking nintendo when they plan tonrelease to NA? Ther is a lot of hoping going around but nobody (game journalists) seems to be doing any kind of journalism. This I finished on Boxing Day after getting it for Christmas. Not even remotely taxing. (I think I was 11 or 12). Probably if I played them in the opposite order my opinion might have changed. Pity Square Enix prefers mobile to Nintendo these days. Most overrated game of all time... is what a troll would say. @Thats-what-she Actually, that's what I thought an year ago, when I was playing it for first time... But I gave this game a second chance and now it's pretty awesome for me. Its the first Zelda game that had the the acctual storyline so...IT ROCKS!!!! I rented this from Blockbuster as a kid and spent hours on it. Never played it again. If you would have asked me last year at this time "what is your favorite Zelda game?" I would have said Link to the Past with out hesitation...in fact I would have highly doubted that there would ever be a Zelda game that good again...Fast forward to the here and now, and my answer is now a toss up. This fantastic game and Link Between World are the very very best Zelda games I have ever played, and also the only two I have ever beat. I think it's a great game but no Zelda game has ever struck me as anywhere near as amazing as everyone makes out. I'd give it a 9 though. One of the greatest disappointments I ever came to play. As I never owned a SNES and something as the VC didn't exist back then, I was so happy when this got released on the GBA and I had the chance to play it – for me it was actually the decisive reason to buy a GBA. But then, it was so much weaker than Link's Awakening. For a long time I could not even make myself finish it. A 5 or 6 out of 10 from me, although the smaller resolution (not the smaller screen, as I played it mostly on television via the GCN GameBoy Player) of the GBA version may have had a negative impact on my experience. If this game did not receive a 10... I would have been very mad. This game is amazing!